Three walks in one day? What dog would not be delirious with joy? Saturday began with a romp round the forest, a five-mile run with the squirrels and the deer. Macaulay the family dog’s utter favourite. And then nine-year-old Felix expressed a desire to do one of his scooterthons. This entails the family hitching up the dog on a lead and following my son through the winding alleys of the houses between us and the great old house down the road. Felix chooses the route. The dog looked gratified as we took the lead down for a second time. Round and round the houses we went, arriving back in time for dinner. And then- could it be? Following a family after-dinner rest, the two adults proposed a walk to the other great house, a couple of miles away, and off we set again, across the forest and far away. On the way back, Mac was flagging. The spirit was willing but the flesh weak; there were still scents to smell and markers to leave, but the little scruffy dog had nothing left to give. And there was something else: he did not quest ahead; he stayed close between us, keeping Phil as a talisman on one side, me on the other. But we thought nothing of it. Back at home, he sought a soft place to lie. And twenty minutes later, when I came up to check, it transpired he had chosen the pristine duvet of my daughter’s bed. No! I admonished, and when he did not move I moved closer. Mac does this thing. If you ever try to move him by pulling his collar he just freezes. He knows he is much harder to move if he just does a sit-in. And usually, when one calls his bluff and pulls him off a bed or a sofa, his legs miraculously work by the time he reaches the ground. And the little dog could not find his legs. He met the floor nose-first. It seemed that Macaulay was poorly. I spent a great deal of time apologising to him. But whilst well Macaulay would have cashed in on my chagrin, poorly Macaulay was not interested. He just wanted to sleep. We made a bed on the sofa in our bedroom and lined it with soft duvet. We put a bowl of fresh cold water nearby, and the dog got up, and the dog slept. In the air above him hung wretchedness. And thus, the whole family moped and fretted. Clive Bond, the sleek black family feline, is only just out of kittenhood, and Mac is his chosen surrogate parent. We heard a soft warning rumble from the dog, and turned to see that the cat had simply walked up and stood foursquare on Macaulay’s poorly tummy, craning down. Was the dog coming out to play? No. The cat responded obediently to the rumble and pottered off. In the middle of the night, Mac got up for the first time to have a long draft of water. And yesterday, all day, he convalesced. Lat night I relented. He got up on our bed and I did not shoo him off. We just fussed over him and urged him on towards wellness. Now the dog cashed in. 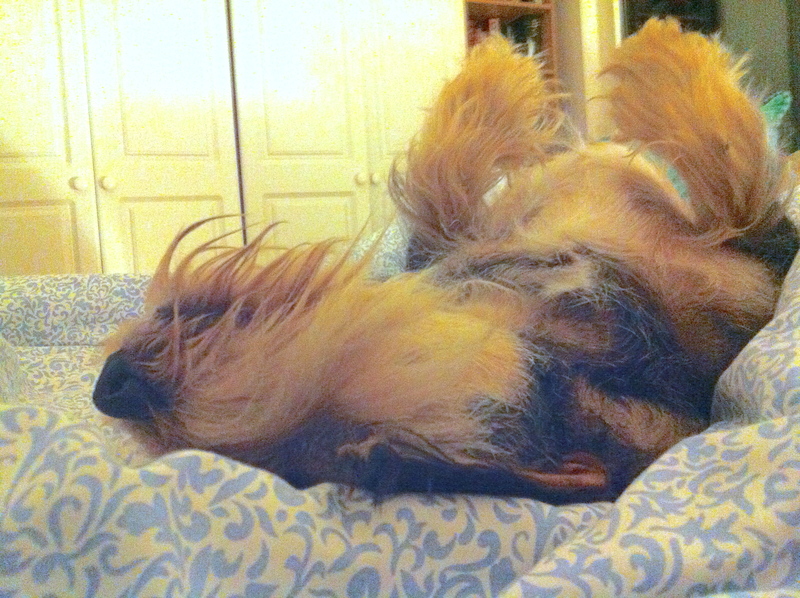 He turned on his back and regally received tummy rubs and other homages as his right. He lay there, in heaven, tousled and disreputable, ecstatic with all four paws in the air and a tail which once more wagged. Let us see if the experience has brought back his joie de vivre in a forest romp this morning. Posted in Macaulay The Dog storiesTagged dogs, family, petsBookmark the permalink. Love that picture. Pure doggy bliss! Thanks Sidey. He’s looking much better today. Cheers Wanderlust: it’s taken him an extra day but he looks perkier now. 😀 It will, IE. He looks better but slightly wistful. Oh! poor Mac, get better soon. May be he is getting just a little bit too old for scooterthons!!! remembering that dogs age seven times quicker than we do per year. Indeed. I think we will be a little more cautious with walks from now on! He is, Jas, thank so much. It’s a grim business, isn’t it, Tilly? He’s much better today, thank you! Wonder what on erf poorlied him? Hope he doesn’t figure out that if he fakes it well enough, he will get special consideration! I think he might be trying it on right now, Col. Being a canny Scot, I didna think he would be long in the reasoning of it! Poor little Master Mac, good to know he is on the mend and getting special attention. Thanks Lou. Back to his sprightly self now. Oh, good. Sounds like he’s on the upswing, a return to vim and vigor. Hope that trend continues. He is, and it did, Nancy. Thanks! Hoping that it was nothing more serious than just one romp too many! Feel better soon, Mac! Oh, poor Macaulay. I know just how he feels, having been on far two many exhausting romps myself of late. Nothing like a good lie-down and tummy rubbing to make things all better. Oh, poor little Mac! Doggies with short legs = sad doggies on long walks. At least he didn’t make you carry him home…as my little princess has done. That’s a humiliating walk of shame. Jim, you may have it. That sounds highly likely. I’ll check his reading material immediately. haha, what a cutie 🙂 And well-rehearsed in the art of woebegone airs and being granted privileges. Gwynn does that once in a while as well – we exercise him that little bit too much and he spends the next day sleeping, groaning when we try to get him up and about. Must cut down on his exercise, Lexy…never thought I’d hear myself say that! Well, please give Macaulay my best wishes and my hopes that he is back to his old self as soon as possible. Dear Kate, like your reader “Karen Snyder,” I hope that is malaise on Macaulay’s part is nothing more than simply being exhausted by the three romps. Please keep us posted. Peace. Sending healing beams to Macaulay. I hope he’s better very soon. It is, Rafael: and he did. Eventually. Aw… hope he’s feeling better now, Kate! Thanks, Tom, he’s chirpier today. That’s good to hear, Kate! I hope he’s feeling better now. I know how scary it is when the family doggie is under the weather. Thanks, heather- he’s back to himself now, thank goodness! Sad to think of Macaulay feeling poorly. Harmonious vibrations and cyber TLC coming his way. Hopefully, he just overdosed on bliss has already returned to being his regular self that has found a semi-decayed corpse in the forest. Indeed. Nothing like a semi-decayed corpse to pep one up, and get our dog back on form, Lame. Fingers, legs and eyes crossed Kate. I think poor dear Mac has winter blues! Spring is coming and he’ll be in full mischief again! Like many of his human friends! 🙂 And oh that photo! Perfect example of why we love them so! I do hope that Macaulay is feeling much better by now. It’s always worrisome when our pets are not their rascally selves. Then, we know for sure that something’s not right.